The completely revised and updated electronic edition of Recipes for Weight Loss is now available. If you have dreamed of increasing your income by offering a weekly hypnosis weight loss clinic or a hypnosis audio business, then Recipes for Weight Loss is the book for you. Recipes for Weight Loss contains ten totally different, thought-provoking, insightful, and highly therapeutic weight loss scripts that licensees may use for hypnosis weight loss clinics or may record in their own voice and market them to the public! Licensees may also dissect the scripts, which contain 10 different inductions, progressive relaxations, and therapy styles, and adapt them as they see fit to any other programs they offer. Best of all, the license is included with purchase of this book! Recipes for Weight Loss includes an extensive 12-page section of author, Julie Griffin’s, tips and strategies for success. 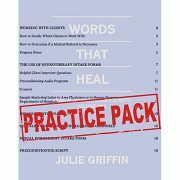 Julie has conducted over 600 group hypnosis programs in 17 states and shares her best inside information. These tips & strategies were designed to help you to expand your business and your income. Your own business is limited only by your drive, your desire to succeed, and your imagination! Start your own weight loss business. Download your copy of Recipes for Weight Loss now! Does your book come in PDF form and if it does, is it password protected or can I work on the text in it if I desire? It is not password protected. Licensees may dissect the scripts, which contain 10 different inductions, progressive relaxations, and therapy styles, and adapt them as they see fit to any other programs they offer. The license is included with the purchase of the book.